There were two prior versions. you can get those at two of my previous wallpapers. This is the final version. It is perfectly focused so no matter what size of your screen is, as long as it is black background, it will fit. Now the glow comes from the center and the surrounding fades into darkness, this is perfect for saturdays. Special thanks to Paul W and Jason at Hedkandi. Beautiful bursts of color and the glow is awesome. Really well done! if i can name this new style... i only can get a funkyveck... nya! good! 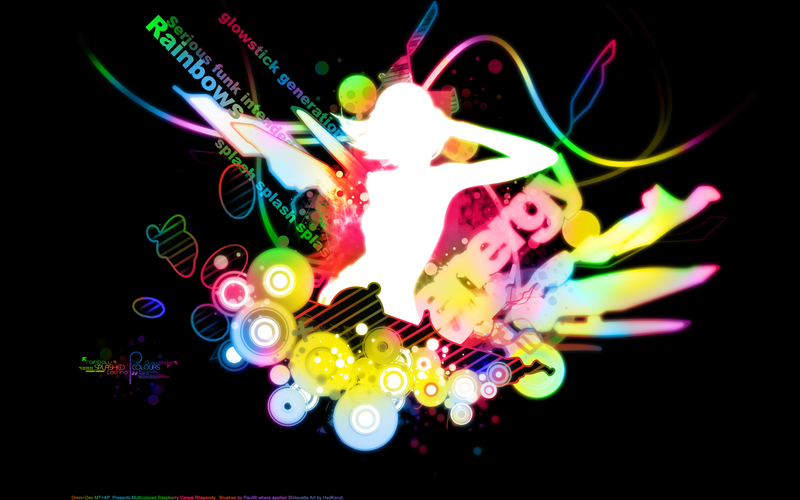 wow the wallpaper looks very good, i like the strong colors and the glow looks great. Not many walls I see become instant backgrounds on my computer, but this one qualified. Colourful, groovy and plenty of room around the edges for where I usually keep my icons. In my perspective, an ideal and practical desktop! Keep up the awesome work and favs for you. Before I start praising this work, question: How many of your works are not in the elite gallery? Now... this wallpaper is special because the character is white... It adds to the art's funkiness and sweetness. In contract with the black bg, the work is lovely. Don't get mad at me, but if you have the right brushes and ideas, I think you can make a wallpaper like this in... at most an hour. Correct me if I'm wrong. The array of colorful hues and glow of this wall instantly marks this wall as a fav and a new desktop! You should make more walls with the same design and style. I LOVE those colors, awesome! LOVE the colors its soo out there great wallpaper!